Are you thwarted in your attempts to secure your gear? This may be a bad pun, but it's a bad feeling when gear is lost to a capsize or rough water. Cartom's Marine Wrap-On Straps will help minimize the risk of losing even the smaller things. These unique hook and loop straps can be easily secured to gunwales, canoe thwarts, or lines. A D-Ring with a removable snap-hook on one end adds still more options for securing accessories. Easy on, easy off Marine Wrap-On Straps stick to themselves and require no tools, no screws and no adhesives and still hold firm. HOLDS WHEN WET OR DRY! 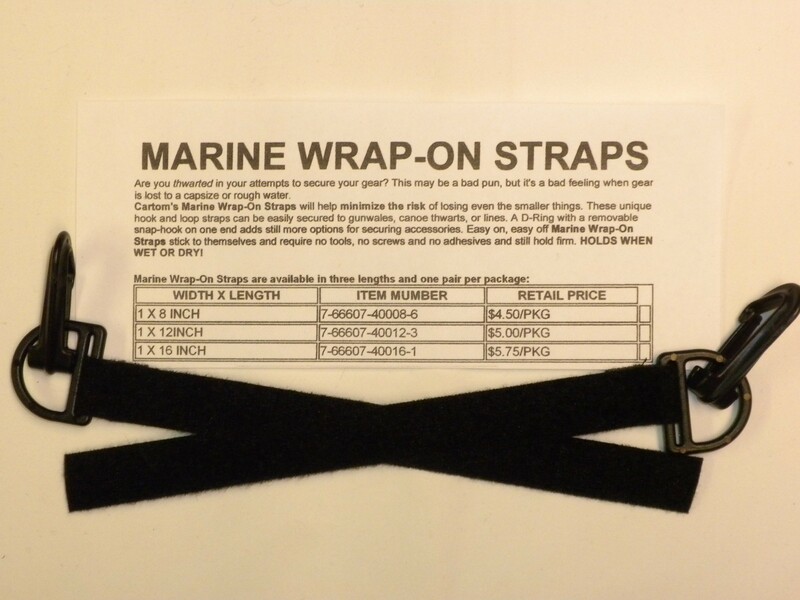 Marine Wrap-On Straps are available in three lengths with one pair per package.